AMPed provides students with an advantage when entering the AMPR and IB fields. Through networking and professional development events, internship opportunities and peer discussions, our members gain the skills necessary to exceed in their industry and leave university prepared for the real world. Thank you to the following partners for providing our members with exclusive deals and discounts. Stepz Fitness St Lucia: 15% off any membership for all Digital Membership Card holders. Membership to AMPed is available on a yearly basis for only $10. Membership is open to all QUT students, and associate membership is open to alumni and non-QUT students. While you are at it, join the AMPed Members Hub so you stay in the know. The Facebook group is a place for you to connect with fellow society members and like-minded individuals, keep up to date with society events and discuss everything relating to AMPR and IB. Invites to exclusive social and networking events. Opportunities to liaise and connect with industry personnel. Early-bird discounts on tickets to all of our events. Exclusive discounts on-campus and off-campus. Monthly newsletter featuring available job opportunities. AMPed is Queensland University of Technology’s student society for advertising, marketing, public relations (AMPR) and international business (IB). The society was first established in 2005, and in 2015 was rebranded, revamped and relaunched. Provide a club to facilitate the interaction of Advertising, Marketing, Public Relations and International Business students. Provide professional development and networking opportunities for our members. Provide social events to encourage camaraderie between members. AMPed provides students with an advantage when entering their desired fields. 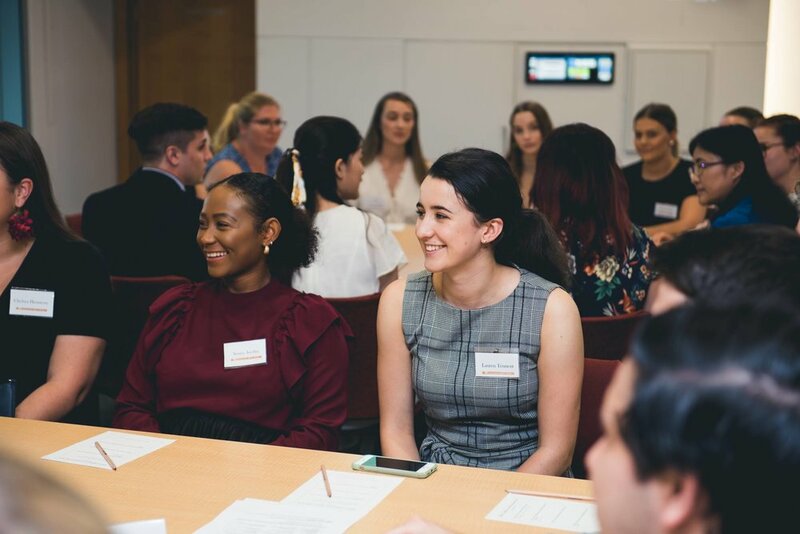 Through networking events, intern opportunities and peer discussions students gain the skills necessary to exceed in their industry and leave university prepared for the real world. Are you passionate about all things advertising, marketing, public relations and international business? Are you eager to be more involved in the running of AMPed? Fantastic! We strongly encourage you to become a member and attend our events so you get a feel for the society. Each year AMPed's Executive Team take on Officers to help with the running of the society. Towards the end of semester two AMPed holds its Annual General Meeting (AGM), where members elect the Executive Team for the following term. Only AMPed members are able to vote and/or run for a position within the society. We will post about available positions, so keep your eyes peeled on your emails and our Facebook page. AMPed's Executive Team are committed to meeting the society's objectives and making AMPed the best possible society for its members. The AMPed Team can also be reached via info@ampedqut.com.au.